Fifteen years ago, things might have been different. I spent pretty much every spare moment I had playing video games. Weeknights, weekends, summers; if I wasn’t in school or at work, I was gaming. I loved video games and there weren’t any real obstacles to keep me from indulging in epic-length gaming sessions. I had my own TV, my own game system and basically no responsibilities. If I wanted to play Final Fantasy VIII again, beat Metal Gear Solid 2 on European Impossible or pull an all-nighter plowing through Mobile Suit Gundam: Journey to Jaburo (a true classic), there wasn’t any reason not to. Jump forward to the present and life doesn’t work that way for me anymore. I have a wife, two kids and a career. There are meals to cook, bills to pay and appointments to attend. Add in friends, family and all the other interests I’ve accumulated over the years and that massive block of time I used to devote to binge-gaming has been slowly whittled down until, most days, the best I can manage are small slivers of time. Playing video games is no longer the focal point of my life. They’re that fun thing I do when I can eke out a few spare moments. 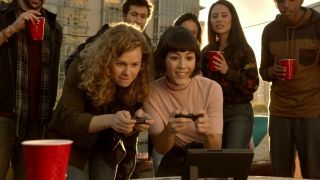 The Switch, to me, looks like a console built to provide more of those spare moments. I couldn’t care less about “cutting edge” at this stage of my life. 4K visuals? The last time a console’s visuals made it a personal must-have was the N64 in 1996. Virtual reality? My living room is a minefield of trampolines, jumperoos, Barbie shoes and Lego bricks. What I want from a console, more than anything else right now, is the ability to play what I want, when I want. One of the biggest reasons I bought the PS4 was because of Sony’s promise of universal Remote Play compatibility. I play a ton of portable games and you better believe I was - and still am - tempted by the Wii U. The Switch might have confirmed its position on death’s door but it still has two Zelda’s remasters and a streaming controller that would fit in perfectly in my busy home. The Switch, to me, looks like Nintendo (much like with the Wii) observing its competitors and trying to tap into a market that’s being ignored. Gamers aren’t just kids, teenagers and early twenty-somethings with huge chunks of disposable time. It’s a growing demographic that also encompasses parents, professionals and people for whom life has simply gotten busy. And while options do exist for them, none of them are perfect. The Wii U might free you from the shackles of a television, but it still chains you to your home. Remote Play is a nice option, but it’s dependent on WiFi and tends to make games look like you’re viewing them through a filter of fuzz. And while I do love my portables, sometimes I just don’t feel like playing the games I have on them. Sometimes I want something bigger. The Switch’s reveal trailer was all about that. Some might balk at Nintendo using a five-year old game like Skyrim as a selling point for its brand-new console, but for me it is a selling point. I’ll be 30 in a few months. Life is getting busier and it’s not going to slow down anytime soon. I no longer care about having the biggest, baddest beast of a console that ever existed. I want convenience. I want something that will help me find the time to play. If Nintendo can sell me that, I’ll happily make the switch.